Famous for its 1930s Art Deco, latin culture, and endless beaches, Miami makes for a dream travel destination—especially when coming from New York City. Offering an easy escape, not only for its time zone, but also for its convenience—think city to beach in less than three hours. When asked to speak at Soho Beach House’s Fashion For Breakfast—on the brink of launching our first swim collection—our Founder and Creative Director, Rebecca embarked on a getaway to the idyllic seaside locale, full of incredible food, hidden gems, and picturesque places to stay (and shoot!). Join us on her travels, as she weighs in on her love for the southern city, blending work and play with LoveShack family & friends. There's a sensibility here that luxury and the beach go hand in hand…which is so Love, Shack, and Fancy. I’m endlessly inspired by the sentiment of old world Miami and the 1930’s Art Deco. The colors of the buildings, the pinks, celadon greens, mint, sea foam, and sun bleached palette. Plus, I love the music and the Latin vibe throughout the city. It’s all so energetic. Whenever I can, I try to sneak over to Design District and Wynwood for a bit of local inspiration. We’re never not shooting. Quite literally. And, wherever we go, we always have a fun dress-up session (or two, or three…) to get creative. On this past trip, a shoot organically came together at dusk with my dearest friend and photographer, Dean Isdro. As the day turned to night, we splashed in the sea under the ombre sky in our floral dresses, snapping away. We absolutely LIVE at The Soho Beach House. It’s magic. Flying in from New York and then waking up in the morning with nothing but the ocean stretched out in front of us is instantly transportive. Mornings are spent at the Beachbar sipping cappuccinos (with whole milk! ), and nibbling on fresh fruit with pancakes, while afternoon meetings are held poolside. As evening approaches, we meander down the boardwalk to the beach for a sunset shoot, followed by drinks on our terrace—served from the charming bar cart which comes round to each room at 7pm. Typically the night concludes at Cecconi’s with family and friends. For special occasions, we love to organize an evening with our best friends at Casa Tua. The food is delicious and we dance the night away to the beat of the bongo drums. Plus, I always love having Joe’s Stone Crab for lunch, out on the beach. I lived in the Evelyn dress and Angie dress. 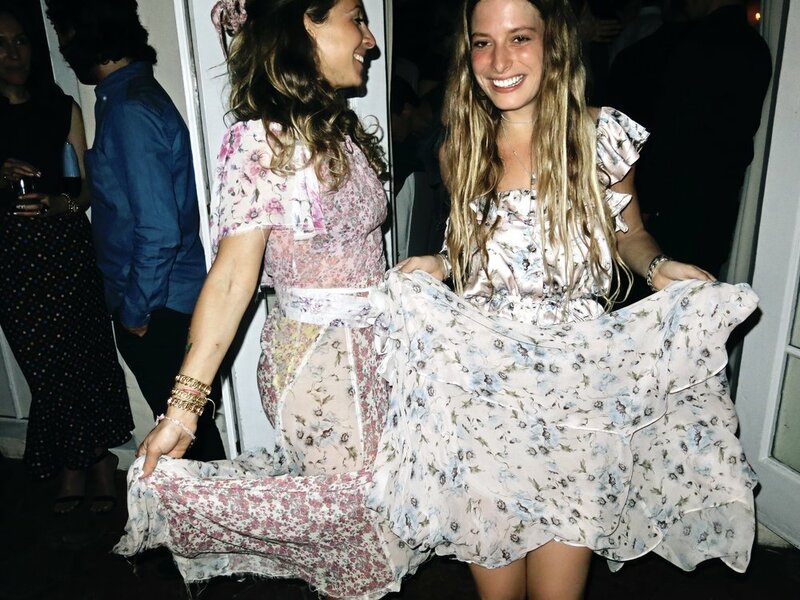 The Madeline dress is my absolute favorite--I have one in the original white and one in pink that I hand dyed. I can't travel without my new LSF bathing suits—they’re mix and match and the only thing I want to wear. Plus, my straw bag with LOVE embroidered in pink, my gold vintage bracelets (that are available at our Sag Harbor shop), and of course my wedges! One evening after dinner, we went back to our room for dessert with a few of my girlfriends and their daughters. We ended up playing dress-up for hours with our vintage pieces, laughing among the piles of tulle while eating ice cream sundaes. It was heaven.